The woman convicted for encouraging two 12-year-old girls to attack a 12-year-old girl with autism was sentenced on Tuesday. Calia Harris, 30, of Cleveland, was sentenced to serve 18 months in the Ohio State Reformatory for Women as well as three years of mandatory post-release control. The brutal beating was caught on several cell phone cameras, so disturbing even the judge could not believe her eyes during the sentencing. "How can we expect these kids to be law-abiding citizens if their parents can't be?" said Judge Kathleen Sutula of the Cuyahoga Common Pleas Court. Harris entered a guilty plea on Aug. 31 to one count each of inciting violence, contributing to unruliness or delinquency of a child, and assault. 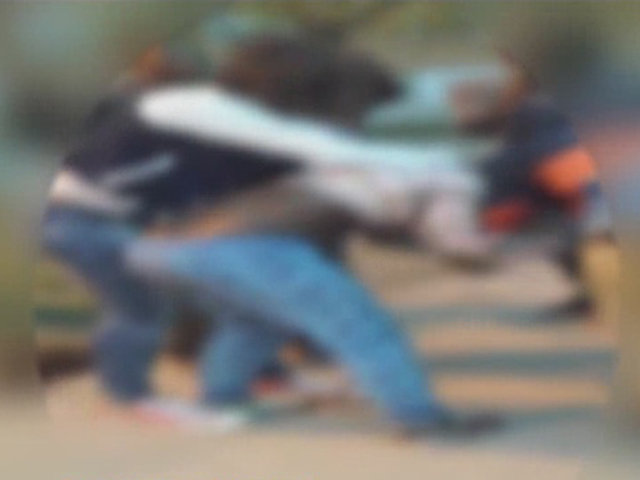 The video shows two girls hitting the victim repeatedly. Harris, who is the godmother of one of the girls, can be seen encouraging the fight, police said. The two 12-year-old girls were charged with felony aggravated riot, two counts of abduction and two counts of misdemeanor assault. "That's not a normal kids fight," said Joyce Swann, the victim's mother, who added that the bullying of her daughter has not stopped. "You can't go to school because they bully you there. Can't be at home because they bully you there. Boys and Girls Club, they bully you there. Library, they bully you there. Where can you go?" she asked.